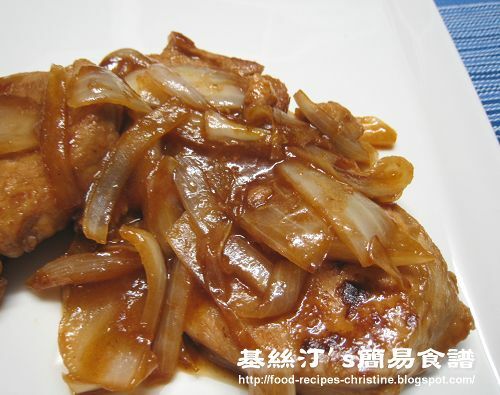 This Braised Pork Chops with Onion (洋蔥豬扒) is very easy to cook. All you need is to have pork chops and onion. Then you can cook this dish within half an hour. Best of all, the sweet and sour sauce is perfect for a bowl of steamed rice. Rinse and dry boneless pork chops, then slice into pieces if you like. Tenderize pork chops with the back of a chopper and blend in marinade. Leave for 15 minutes. Heat 3-4 tablespoons oil to fry pork chops till both sides are golden. Remove and drain excess oil. Heat 2 tablespoons oil to sauté shredded onion until light brown. Pour in seasoning mixture. Put in chops again, and stir fry till sauce lessens. Dish up and serve hot. We just ate this. My boyfriend and my mom really liked it. Thanks again and more power to you! Wonderful! Thanks for letting me know that you tried and liked this recipe. Really encouraging! wow! this was really good! I tried it tonight. I added tomatoes after sauteeing the onions for about 1-2 minutes and added some sugar. After adding the pork chops with the onions, I covered the pot for about 5 mins. I also added a little bit more sugar at the very end. I think I finally found my pork chop recipe for non-deep fried baked pork chop on rice! Thank you Christine! Nice tweak ! Tomatoes go really with pork chops. This is a go-to recipe for me and one of the only ways I can get my two and a half year old son to eat any meat! Thanks again for another wonderful recipe! Hi, we love this recipe and make it nearly every fortnight. Actually we love all your recipes and I make something from your vast collection once a week at least. Wonderful ! So glad you love my recipes. Thank you ! Hai Christine, i tried this recipe yesterday. My son loved it so much. He asked me to cook this pork chop again for today. Wonderful!! Keep posting great recipes. Thanks a lot!! Very glad that your son loved it. So happy for you too. Sure, will keep sharing more delicious recipes. Hi Christine, may I know how many ppl this serves? thank you. It's for about 2 to 3 people.